Dressing Room Diaries + Lilly Pulitzer After Party Sale! First up, I have a brand new round of dressing room diaries for y’all! I stopped into Nordstrom, Banana Republic, and Lilly Pulitzer (duh) this weekend and found so many adorable pieces! Fall clothing may be hitting the shelves, but this girl is still ALL about summer! As always, these pics are meant to help you see pieces “in real life” – when lighting isn’t perfect, my makeup is waning, and I’ve been trying on one too many outfits 🙂 If you have any questions I don’t answer- drop ’em in the comments below and I’ll be sure to help! Charles Henry Cold-Shoulder Dress (wearing size Small)- The colors in this dress are seriously so beautiful in person! I loved the flattering fit, the spicy look of the cold-shoulder, and that the long sleeves would make it easy to transition to fall (I see it with booties!). I’m normally a small/medium in dresses, so I would say this one runs a little big and you are OK to size down if you’re between sizes. Adelyn Rae Print Halter Shift Dress (wearing size Small)- This dress has so many fun details in person! Right around the waist there is a fun little ruffle that is so feminine and girly- I love it! This is the kind of dress that would be a wardrobe workhorse; wear wedges for a girls night out, and throw a blazer on and add pumps for the office! Banana Republic Paisley Tie-Collar Blouse (wearing size Small)- I ordered this top online with some GapRewards in a Medium and it was huge, so I stopped by the store to exchange it for a small. However, it has a pretty boxy fit so I think it needs someone taller than me to rock it 🙂 But I loved the pattern so much that I scooped it up in the dress version (below). If you love than make sure to size down! Lilly Pulitzer Ophelia Dress in “Get Trunky” (wearing size Medium)- I already own the Ophelia in another print, so I knew without a doubt I would love this one. The print is a little more subtle if brights aren’t for you, and the fit is beyond flattering. Fit Tip: I could wear a small in this, but due to the length and breezy fit I prefer a medium to give me a little more coverage and peace of mind. Lilly Pulitzer Blythe Dress in “Casa Azul” (wearing size Small)- Another great swingy dress for this heat, I sized down to a small. This dress would be easy to transition with a neutral cardigan and boots later in the year! Lilly Pulitzer Sally Dress in “Ocean Jewels” (wearing size Medium)- I was intrigued by the material of this dress and I had to try it one! It’s a soft scuba material that is seriously so comfy to wear, but looks chic! I love the rich colors in this “Ocean Jewels” print too! Lilly Pulitzer Kassia Dress in “Going Coastal” (wearing Size 6)- I feel like it has been way too long since Lilly did a traditional fit-and-flare dress but I’m sure excited they decided to make their comeback with this beautiful one! I feel like online it looks a little “fuller” than it is in person; it’s actually a very silky material and very lightweight (which I love)! Runs TTS. Now, drumroll please…. the Lilly Pulitzer After-Party Sale is confirmed to be this Monday, August 22 at 8am!! This is one of my favorite sales of the year (it only happens twice) and where I normally stock up on most of my Lilly purchases! Y’all have really appreciated my tips and tricks in the past, so I’m sharing them again today to get you ready for the big event! Get your account up to date: The website will be down for maintenance from 7-8 am so if you want to get your account accurate (which I recommend) you will need to do it before then! So, log in this weekend, enter you payment information/shipping address (nothing worse than having to scramble to find your credit card), and then Monday all you have to do is press “pay” & your treasures will be yours! Make a list of your must-haves: Like the January sale, everyone will be placed in a virtual “line” to enter the sale and after you checkout you will be sent to the back of the line. So although you can still place multiple purchases (all shipping is FREE!) know that they can’t be one after another like in years past! This is definitely in an attempt to make it more fair to everyone & I think it is a wonderful thing (more Lilly for everyone!) ! 🙂 **NOTE: Don’t be discouraged if your wait time says something crazy like “14 hours”- it usually moves way faster than that! Last year I was in within 30 minutes! Know when it ends: This year’s sale will run two full day and will end Tuesday, August 23rd at 11:59 PM. Sort by Size- What fun is it to fall in love with an item when it doesn’t come in your size? (No fun that’s what!) So make sure to sort by size when you log in so you don’t waste precious time looking at things that won’t fit! (Don’t know what size you are? I recommend stopping at your nearest Lilly store today and trying on a few things for fit!) Also, all sale items are final sale- so make sure you’re sure before checking out! UPDATE from past sales: Like January, Corporate stores can participate in the sale this year, so if your size is sold out online call your local store b/c they may have what you want! Have an amazing weekend! I’m helping to host a fashion show tonight & then have a baby shower for one of my best gals Saturday & my Fantasy Football draft on Sunday! Can’t wait for all this on-the-go fun! 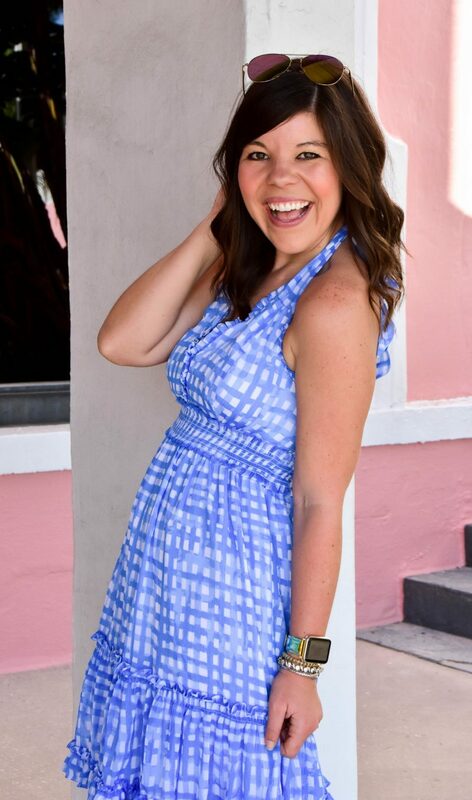 Next Post Lilly Pulitzer After Party Sale + Ali Dress! That cold shoulder dress is by far my favorite! It's a great dress to transition into fall with! It looks like you had an amazing shopping trip! Have a great weekend. Hi Gentry. Just found your site recently. You are adorable. I love your taste! This is my first Lilly sale.. I am curious about a couple of things. First, seeing the dresses on you, they don't seem as short as they sometimes seem to me.. May I ask how tall you are? I am 47 so I feel like I can't go too short, you know? I love that Jackie shift in caught in the coral and was looking at a long sleeved dress with the same print. These items say they are new on the Lilly site. Does that typically mean they don't go on sale, just the stuff that has been there awhile does? I love the first dress you have on and ALL of your Lilly items! I am so excited for the Lilly sale! I have plenty of gift cards I have been saving for this day! I love these kinds of posts – seeing real people in clothing is my favorite! I am adding you to my Bookmarks! Stopping over from A.Liz Adventures for the linkup – hope you can go my blog too. Have a great weekend!